Switch your direct deposit to your MSUFCU checking account by April 30, 2019, and you could win big! But don't wait -- the sooner you switch, the more you could win. There will be weekly winners of $500, and a grand prize winner of $5,000. 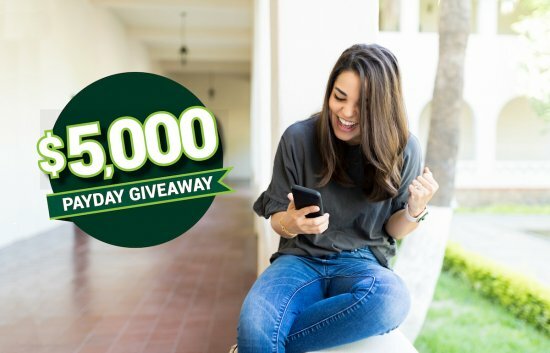 The MSUFCU $5,000 Payday Giveaway Contest begins at midnight EST 2/1/19 and ends at noon EST 4/30/19. No purchase or transaction is necessary, and there is a limit of one entry per account. Employees and immediate family members of MSUFCU and contest sponsors, as well as MSUFCU board and committee members and their immediate family members, are not eligible. Winner of grand prize will be drawn 5/2/19. Weekly winners will be drawn every Friday 3/8/19 - 4/26/19 by the MSUFCU Internal Audit department, whose decisions are final. Chances of winning a weekly or the grand prize are based on the number of entries received. If 1,000 entries are submitted, chances of winning are 1 in 1,000. Winners will be notified by email and/or phone and have 5 business days to respond. Failure to respond in 5 business days will result in the selection of a new winner. To enter, you must have 2 consecutive direct deposits of your net paycheck ($500 or more) to your MSUFCU checking account. You also may send a 3-inch by 5-inch card with your name, address, phone number and email address to: MSU Federal Credit Union, ATTN: Marketing, 3777 West Rd., East Lansing, MI 48826-9946. The prize package is valued at $5,000 for the grand prize and $500 for each weekly prize. Liability for any applicable federal, state, or other taxes will be the sole responsibility of the winner and no prize will be awarded without receipt of the proper legal paperwork as determined by MSUFCU. -To allow MSUFCU, unless prohibited by law, to use his/her name, city and state of residence, photograph, and/or likeness for advertising trade and/or any other purposes in any media now or hereafter known without further compensation, permission, or notification. All images are the exclusive property of MSUFCU. -That aforementioned parties and their respective officers, directors, shareholders, employees, representatives, and agents shall have no liability and will be held harmless by entrant for any claim, action, liability, loss, injury, or damage to entrant or any other person or entity. This includes personal injury or death to entrant or any other person or damage to personal or real property due to the acceptance, possession, use, or misuse of a prize and any travel or travel-related activity thereto or participation in this promotion. MSUFCU reserves the right to modify, suspend, and/or terminate this contest should viruses, bugs, nonauthorized human intervention, or other causes beyond the control of MSUFCU, corrupt or impair the administration, security, fairness, or proper play of the contest. In case of suspension or termination, a notice will be posted, and, at MSUFCU's discretion, winners will be selected from eligible nonsuspect entries received before the event was suspended or terminated. MSUFCU reserves the right to disqualify any entrant if his/her fraud or misconduct affects the integrity of the contest or fails to remain in good standing with MSUFCU. MSU Federal Credit Union maintains the right to change or modify these rules at any time without notice. MSUFCU is not responsible for any typographical or other error in the printing of the offer, administration of the contest, or in the announcement of any and all prizes. By participating, entrants agree to these official rules and to the decisions of the results of the contest, which will be final and binding in all respects.